The Jaboticaba (also called Jabuticaba or Brazilian Grape Tree) is a very unusual tree native to Brazil whose fruits are formed directly on the trunk and branches. The grape tasting fruit has a thin astringent purplish black skin, with a sweet white fleshy pulp and can be eaten fresh or be used to make jellies and drinks (plain juice or wine). Classified as a large shrub or small multibranched evergreen tree, the jaboticaba has dense foliage and is quite ornamental although slow growing. Up to four times a year (often after heavy rain) small yellow-white flowers followed by the fruit dramatically emerge directly from the trunks, limbs and large branches. It is this quality which makes the jaboticaba very useful as an exotic edible hedge in small yards - as it can be pruned to shape with no loss of fruit. 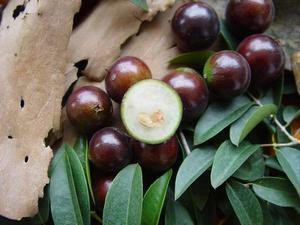 Jaboticabas may begin to bear fruit anytime from 4 to 10 years old. Only one plant is needed to grow fruit, but a few close by enhance crop yield via cross pollination. Traditionally, the sun-dried skins have been used as a treatment for asthma, diarrhea, and gargled for chronic inflammation of the tonsils. Full sun to part shade. Frost tolerant to -3C when established but protect from frost when young. Water well to encourage maximum crop yield. Do not over fertilise, although a small amount of slow release/organic fertiliser or organic matter such as compost mulch is fine. Prefers acid soils.